Angie in T.O. : CAPE MAY CAME TO US! CAPE MAY CAME TO US! We've often wondered what critters and birds visit our yard when we're not at home. 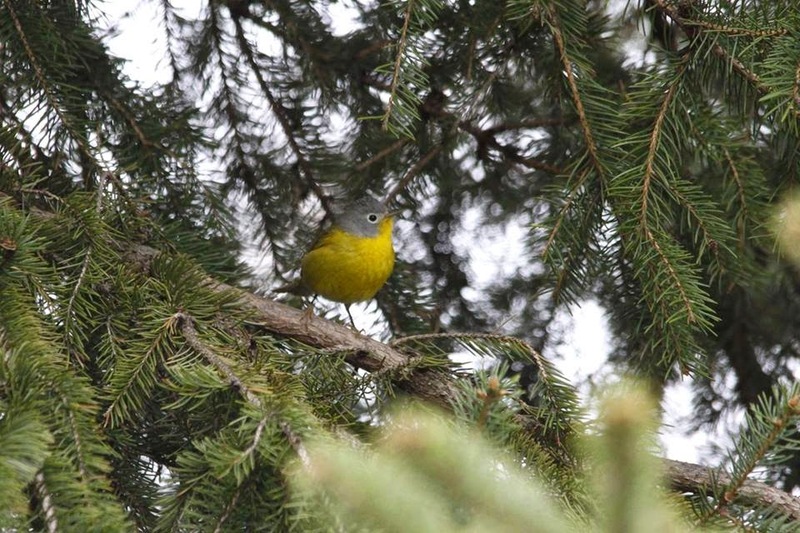 And after Rob spotted a Nashville Warbler in the backyard last May, we really got curious about what birds we miss stopping in during Spring Migration. I missed the Nashville Warbler last year, but tonight I lucked out! Nashville Warbler in our backyard, May 2014. Rob and I are on the same shift this week, first time in years! And we've been enjoying the backyard after work when the weather was good, like today. There was lots going on in the yard, our regular birds, our Baltimore Orioles have returned, Squirrels running around and Rob's flock of Pigeons. I was sitting up on the deck when I heard a different call, and after hearing it for a minute or two I got up to investigate. Rob had been down back, but he had heard it too, and after seeing me get up to look, he started looking as well. He spotted it at the top of one of the two pine trees that are right in front of our deck. 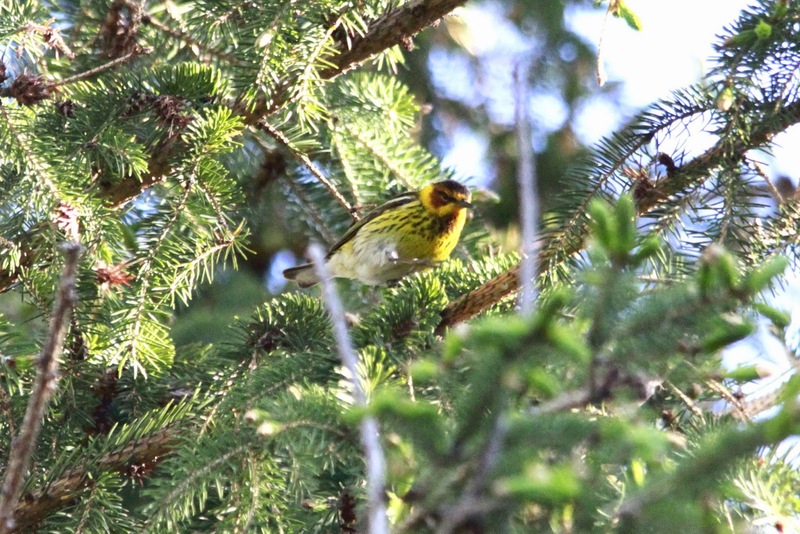 A Cape May Warbler! Luckily he had his camera on him, and he started clicking away. He was pretty excited, as was I, but he exclaimed at one point, "I hope I get one good shot, I have no idea what my settings are!". 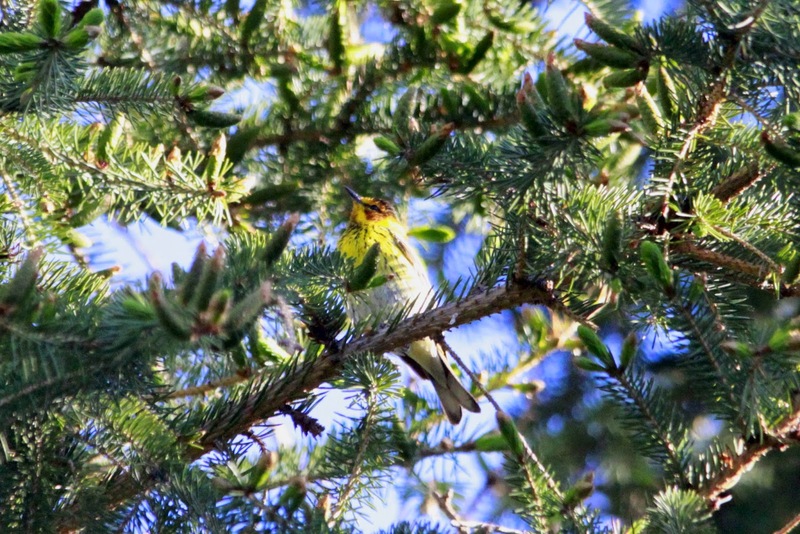 This is a new yard bird for us, and only our second warbler. 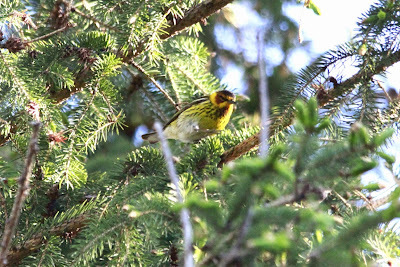 We haven't seen many Cape May Warblers, and this was probably the best look we ever had of one. I always have my bins with me in the backyard and he enjoyed bouncing around in our pine tree for quite awhile. The Cape May caused lots of excitement for us tonight! We are thrilled that our Baltimore Orioles are back for another season, we are patiently waiting for the Hummingbirds, we love all our regulars, but this little beauty caused a whole lot of excitement for us. Our neighbors must think we're looney. This time last year we were in Cape May, New Jersey on a birding trip, tonight a little Cape May came to us. LIFER ON INTERNATIONAL MIGRATORY BIRD DAY!